A study conducted by the Employment Policies Institute states that a hike to a $15/hr minimum wage will cost California 400,000 private sector jobs. Workers in two industries in particular are purportedly the most vulnerable. On January 1, California’s minimum wage will increase to $11 per hour, up from the current level of $10.50 per hour for businesses with 26 employees or more. After 2018, the Golden State will increase the minimum wage by $1 every year until 2022, when it will reach $15 per hour. A new study, conducted by EPI, a fiscally conservative group, analyzed employment trends from 1990 through 2017, and revealed that every 10 percent increase in the minimum wage in California has resulted in a 2 percent decrease in employment. The impact was larger for lower-paid workers, as the decline rate hit 5 percent for each 10 percent increase in the minimum wage. The job losses represent 4.1 percent of employment in the counties studied in California. The most populated counties in the study will see the largest number of workers losing jobs, as smaller counties will see a bigger percentage of workers losing their jobs. The Institute for Research on Labor and Employment (IRLE) at UC Berkeley discovered through a study of their own earlier this year that a higher minimum wage would add around 13,000 jobs to the Golden State’s economy by 2023. Without this increase, IRLE estimates employment would only grow 1.4 percent annually. The IRLE also admits that raising the minimum wage can have negative consequences. “A higher minimum wage induces some automation, as well as increased worker productivity and slightly higher prices; these are the negative effects,” the group stated. 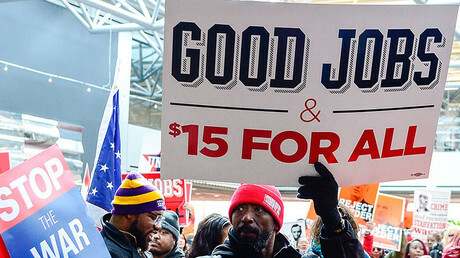 Another study released this year was conducted by a group of economists from the University of Washington, and commissioned by the city of Seattle, to review the effects of the Seattle City Council’s vote in June 2014 to gradually increase the minimum wage to $15 per hour by 2021. The economists in this study found that low-wage workers lost an average of $125 a month due to the wage hike. Some employers in the city said they were not able to meet the demands of higher wages, as a result of the increase. This study was significant due to the fact that the economists had access to data from the state of Washington on workers’ earnings and hours. However, as the prospects of an increasingly automated workforce and higher costs are often cited as bad for rising employment, Another study has concluded with the exact opposite findings. On January 1, 2017, Massachusetts and Washington became the country’s first states to implement an $11 per hour minimum wage. However, topping that figure on the same day, was the District of Columbia, which raised their minimum wage to $12.50 per hour.